Recombinant fragment, corresponding to amino acids 362-411 of Human Doublecortin expressed in E. Coli. 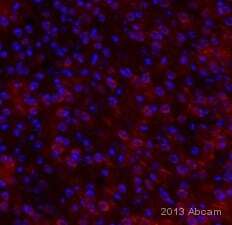 Human Doublecortin recombinant protein; Mouse heart lysate; HepG2 and SK-N-SH cells; Human brain and kidney cancer tissues. Our Abpromise guarantee covers the use of ab135349 in the following tested applications. WB 1/500 - 1/2000. Predicted molecular weight: 49 kDa. Immunohistochemical analysis of paraffin-embedded Human brain tissue labelling Doublecortin with ab135349 at 1/200 dilution followed by DAB staining. Flow cytometric analysis of SK-N-SH cells labelling Doublecortin with ab135349 at 1/200 dilution (green) or negative control (red). Immunofluorescent analysis of HepG2 cells labelling Doublecortin with ab135349 at 1/200 dilution (green). DRAQ5 fluorescent DNA dye (blue). Immunohistochemical analysis of paraffin-embedded Human kidney cancer tissue labelling Doublecortin with ab135349 at 1/200 dilution followed by DAB staining. Expected MW of recombinant protein is 34.1 kDa. 1. Multiple rounds of fresh-frozen cryofixed E14 brains, with sections fixed in 4% PFA or FAA for 10-20 minutes. Antigen-retrieved with and without boiling Sodium Citrate (pH 6) for 10-20 minutes. 1 hour blocking in 5% secondary-specific blocking solution with Triton, 1 hour room temperature or overnight at 4 degrees, washed 3x 5 min with PBS, 1 hour secondary (multiple ones), washed 3x 5 min PBS and coverslipped. 2. Multiple PFA-fixed E14-16 brains (heads overnight in PFA), cryofixed, cut, and stained according to above protocol. 3. FAA fixed paraffinized E16 and P30 brains, deparaffinized and antigen-retrieved with boiling sodium citrate. Staining protocol followed as above. I've attached a few pictures of my most recent staining attempt (fresh-frozen, PFA and FAA fixed) along with staining done with the exact same secondary for a different primary antibody (same experiment, secondary control). 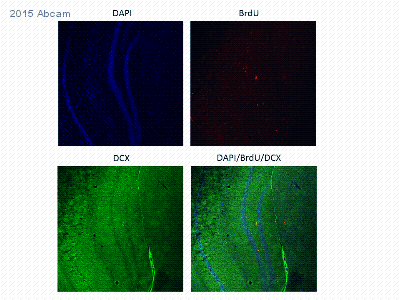 I've also attached a picture of previous staining with your Rabbit DCX antibody at both E14 cortex and P60 hippocampus. Could I please exchange my non-working ms anti-DCX for a rb anti-DCX (catalog #ab18723)? I should have known better than to order a different antibody than the one I know works. I've gotten great staining with your rabbit anti-DCX and would just rather have that one than try to QC another ms anti-DCX. I apologize the the attachments didn't go through. Was the trouble that you weren't seeing any staining (or high background, etc.)? Could you try sending the images againas a .doc, .ppt, .pdf, or .jpg format? What dilution of the antibody had you tried? I would be happy to send youa replacement of the rabbit polyclonal, ab18723, but would you be able to confirm the above? I just want to make sure we have as much information about this for our records. I apologize for the inconvenienceand I appreciateyour cooperation. I look forward to hearing from you.